in other words 0,00000000000000000000000166 g.
These quantities are impossible to measure in a laboratory. In order to work in the laboratories, we need to use bigger units like the gram, which is measurable on a balance. How have scientists solved the problem with the tiny molecular masses? Answer: With the unit mole (mol). Data: Atomic masses: C = 12, O = 16, Na = 23, Cl = 35,5, N = 14, H = 1. We have already seen that it is impossible to work in the lab with a few molecules, because their mass is not visible. Therefore, it is necessary to use a much bigger number of molecules. Experimentally, it has been proven that an element´s molecular mass expressed in grams always contains 6,023 x 1000000000000000000000000 molecules. 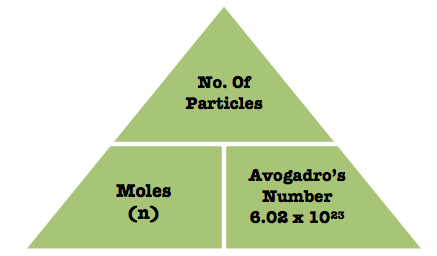 This number is called Avogadro’s number. The number of moles in a sample can be calculated using the following formula. You can use the triangle to remember the equation, but you MUST state it in full EVERYTIME you use it. Task 4g: Complete the following calculations in your class notebook, showing all your working out. How many moles of Rhodium are there in a sample of 412g? How many moles of Arsenic do I have if I have 150g? You measure 10g of Calcium on a balance, how many moles do you have? What is the RAM of Bromine if there are 2 moles in 160g? What is the RAM of Argon if a 20g sample has 0.5 moles of atoms? What is the Mr of Manganese if I have 550g, containing 10 moles? How many grams of Gallium do I have if I know I have 5 moles? How much Lithium do I have if I know the sample contains 15 moles? What is the mass of 0.5 moles of Helium? Task 4h: Complete the following calculations in your NSD, showing all your working out. How many molecules do five mol of magnesium hydroxide, Mg(OH)2 contain? Data: Atomic masses: H = 1, O = 16, Mg = 24. How many molecules do 36 grams of water contain? What is the mass of each molecule? Data: Atomic masses: H = 1, O = 16. Goel, A. (2006). Crystallography. New Delhi: Discovery Publishing House.